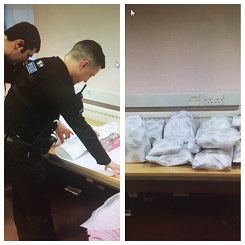 Police officers in Basildon have not only recovered a number of Christmas presents that had been stolen from a shed in the area, but have re-wrapped them before handing back to the owner. See the full story here. The burglar, a 24-year-old local man, was caught red handed with the child’s gifts and had opened them. Rather than just hand them back in that condition, they took them back to the station and wrapped them up nicely. We suppose they were able to do this because they had a lot of (w)rap sheets at their disposal! The thief was arrested and charged with burglary. What a happy Christmas ending to this story.